The Cabinet Committee of Security has cleared the proposal for the procurement of 464 T-90 tanks from Russia. The cost of the acquisition is expected to be worth over Rs 13,000 crores. The deal also includes a Make-in-India element for integration at the Heavy Vehicles Factory in Avadi near Chennai. The acquisition will increase the new T-90 regiments by 10 more units. The new T-90 tanks would be equipped with thermal imaging night sights to allow the tank commander to strike enemy locations during night battles. 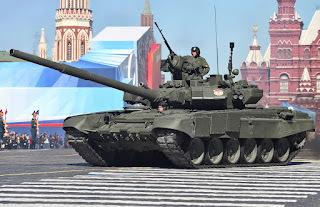 T-90 battle tanks are expected to be deployed on the borders with Pakistan. T-90 has emerged as the main battle tank of the Indian Army. The acquisition is expected to tackle the problem of Indian Army's 4000- strong tank fleet has been battling with night blindness in the past and these new tanks would help in doing away with that. Q. The Cabinet Committee of Security has cleared the proposal for the procurement of 464 T-90 tanks from which country?